This Ultrasonic Leakage Detector is designed to locate the source of the ultrasonic emissions generated by gas or air leaks. The leakage level is displayed by "LED Display Panel", and is covered to audible sound by either internal buzzer or to external optional earphone. Used for measuring Leakage of system. Applicable to detect Leaks in refrigeration and air condition systems, Leaks in heating system, Internal leaks in steam transfers, Compressed air leaks, Tire & tube leaks, Engine seals, Electrical arcing, The bearing problems, Bake system. With the Ultrasonic transmitter, it is applicable to Air leaks around door & window gaskets & seals, Water leaks in roofs, Conduit & pipe identification, Door & trunk seals, Windshield leaks. Human ear can hear sound frequency up to 18 KHz. The sound frequency above 20 KHz is categorized as ultrasonic sound which is not audible. Ultrasonic sound is very directional in nature. We can utilize this nature to pinpoint the exact origin of the sound source where the leak is located. Physics tells us that the gas always flows from the higher pressure region to the lower one. When the pressure difference is only a small opening, the turbulence created by the gas through the small hole then generates ultrasonic sound. In the non pressurized state, the ultrasonic transmitter is applicable, ultrasonic wave can leak from the small hole. Ultrasonic gas leakage detector is designed based on the above simple physics. Leakage Sensitivity Indicator: LED display panel & audible tone. Power Consumption: Approx. DC 25mA. Weight: Approx. 140g/0.31lb (including battery). Ultrasonic transmitter can emit ultrasonic wave, to measure the leakage of the system with ultrasonic leak detector. 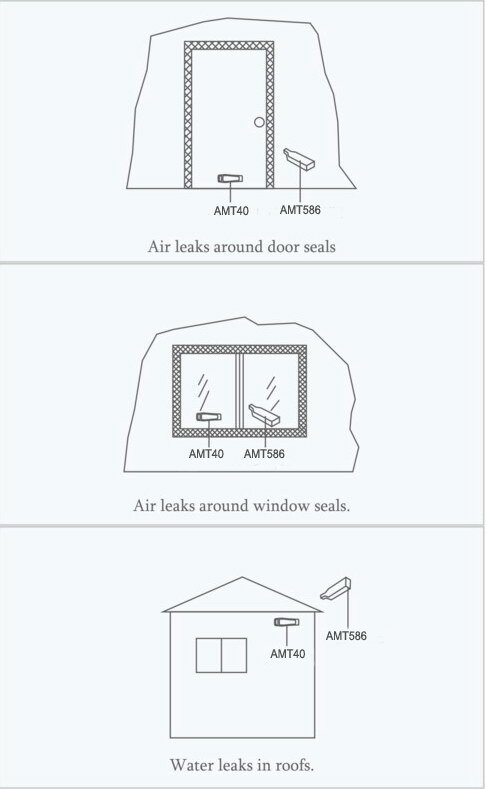 With the Ultrasonic Leakage Detector, it is applicable to Air leaks around door & window gaskets & seals, Water leaks in roofs, Conduit & pipe identification, Door & trunk seals, Windshield leaks. Oscillator Circuit: 640KHz crystal time base & divided by 16. Operating Temp. : 0 to 50°C ( 32 to 122°F ). This Ultrasonic Leak detector is design to locate leaks in pressure and vacuum systems. It can be used to detect and locate the source of ultrasonic emission generated by gas or liquid flowing through a small restrictive opening. 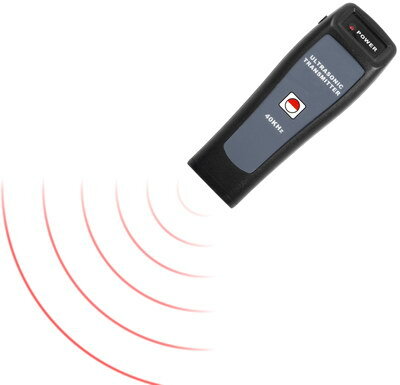 It uses the advanced ultrasonic sensing technique and features small size, light weight, reliable detection, easy use and utility. In conjunction with Ultrasonic Transmitter, can also be used for tightness check in sealed compartments such as container, tank, car, etc.